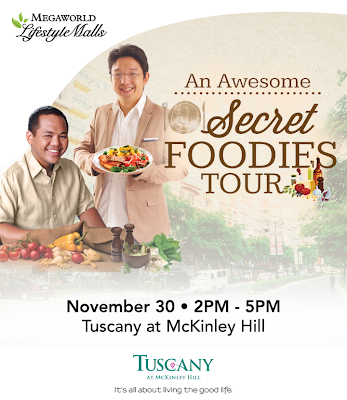 Tuscany at McKinley Hill is Megaworld Lifestyle Mall's newest dining haven, is giving everyone a chance to discover Tuscany's best kept secrets through mouth-watering degustation tour open to the public on November 30, December 7, 14, 21 and 28, 2013 from 2-5pm. The tour will be personally hosted by RJ Ledesma and Anton Diaz. I'd like to give you a hint and some tips about what to expect since I just came home from a preview tour last night. The Degustation Menu is for eight restaurants so make sure that you won't eat prior to the food tour. Wearing comfortable clothing (dress is a must for the women) and shoes are advised. Just from the name itself, you'll have an idea that the place will be serving wine. This restaurant has an extensive collection of wines and it also features a wine vending machine. They are also selling this reloadable card that you can use in the wine-vendo. So cool! And not only that, if you have a limited knowledge about wines, a connoisseur is at hand to guide you. I had a glass of sweet white wine and was given a plate with penoy (duck egg), squid ball, kikiam and siomai. An Italian restaurant that serves good food and wine. I especially like the Oyster Sur Pate di Fegato or Oyster on Liver Pate. I had a glass of white wine that I enjoyed very much as I savor the food on my plate. Delizioso! The owner was also very gracious and regaled us with tales about how he ended up in the restaurant business. You just have to meet and have a chat with him. I'm not really a fan of chicken wings but their Mango Glazed Habanero Chicken turned me into a fan. Very flavorful. The restaurant's Chipotle Chicken Pizza was also very unforgettable. Two thumbs up! The Chocolate Bagel with Apple Cinnamon and Lox is the best! They also serve uber delicious brownies. Store opens early and closes late at night so no need to panic when buying your stash. Also, the bagels are freshly made every day. I was quite full upon arriving at this restaurant although the owner insisted that should be given the Angus Beef Burger and the ice cream. Then Vanessa (RJ Ledesma's wife) who happens to be with our group mentioned that the Organic Maple and Candied Bacon Artisan Ice Cream is a must-have in this restaurant. How can I say "no" to that? I'm glad I didn't and enjoyed the ice-cream. I've learned to love Red Velvet Cupcake because of my daughter. This one's so good. Very moist and I love the cheese frosting. One of the best red velvet cupcake that I've tasted. I brought home a piece for my daughter and she liked it very much- I think she gobbled up the whole cupcake in less than a minute. This was supposed to be the 4th pit stop but we skipped it and joined the group in Marciano's. My group and I decided to just take photos of Sauceria since we're really so full after the cupcakes at Sophie's Mom. It was also 11pm by that time and the big group already left. However, the owner of Sauceria insisted that we try their Tuna Tataki. This pan-seared tuna coated with sesame seeds and other spices was a Portugese creation according to him. OMG. Its really hard to describe the simultaneous burst of flavor from the tataki. Ikatakimasu! To know more about the Secret Foodies Tour, please call 709-9888 or 0917-8380111.